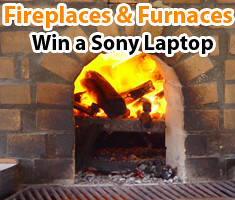 Lenzr has another new online photo contest that just started called Fireplaces and Furnaces. It doesn't seem like the time of year when your focus may be on your furnace or fireplace but it's a photographers dream to take that perfect photo. There are some cool nights still too in the northern regions. Think of the warm glow that either one gives off and capture this essence that we will once again experience in the northern areas. It currently feels like a furnace. Capture the perfect photo and enter online for free and you can win a Sony Laptop thanks to a furnace company that brings 30 years of experience to every furnace installation.